It's time to get back to menu planning. I've been winging it for the past month, and although we've had healthy meals, I hate scurrying around at the last minute to shop for ingredients. I am off my gluten-free diet this week to see how it affects my body, energy, and overall well-being. Although I didn't see a huge improvement in my skin, I think the gluten-free diet was awesome for my digestive system. Something tells me that I'll be going back on it very soon. Monday - Pasta Bolognese (I am making mine with gluten-free pasta). Tuesday - Italian Wedding Soup (This recipe is from Ina Garten's book Back to Basics which I picked up at Crate & Barrel a few weeks ago. Wednesday - Chicken Marsala with sauteed spinach and roasted potatoes. Thursday - Black bean, spinach, and cheese quesadillas. I'm going to try using brown rice tortillas. 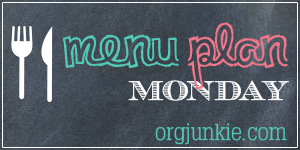 For more meal planning tips and inspiration, visit I'm An Organizing Junkie.